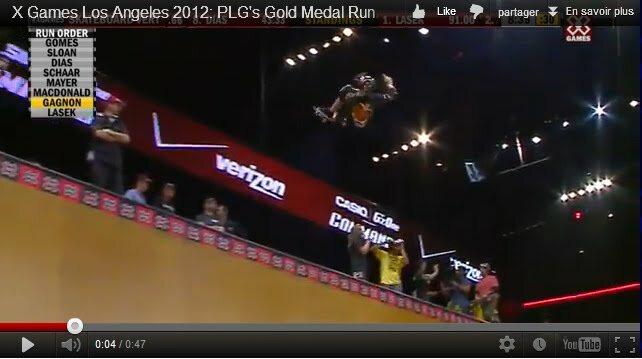 Last year, the battle at the X Games Vert contest was between Pierre Luc Gagnon and Shaun White and Shaun White eventually won. At 32-year-old PLG tied Lasek, 39, with a top score of 91.00, but Gagnon had a better second run, at 88.00 against Lasek's 84.66. "It was great to be out there with Bucky battling," Gagnon, who won his 18th X-Games medal said. "It was a great contest." "I was pretty nervous when I bailed on the last run," Gagnon said. "I thought, `Oh my God, I blew it.' But he ended up sketching out." Gagnon, who won gold from 2008 to '10, did a body varial, a 540 into a 720 and a switch heel flip front side 360 on his 91.00 run. Lasek did a 540 into a 720 heel flip and a 540 fakie invert on his 91.00 run. Gagnon scored his 88.00 on his run in the finals. Andy MacDonald finished third. Lasek, MacDonald, Gagnon and Danny Mayer won the heats. The top qualifier from each 10-minute heat and the four top scores advanced to the finals. Lasek won the first heat with a lot of 540 McTwists and Indy airs. He had to fend off 12-year-old Tom Scharr, who did two 900 spins en route to an 83.66, which was tied for the sixth-best qualifying score. "It was scary all those 9s he did," Lasek said.